When carrying out an insulation test it's important that the appliance is switched on. If the main switch is in the off position, any fault beyond the switch will not be picked up. 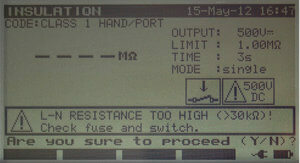 Most modern PAT instruments carry out a pre test check and if they are switched off, display a warning before proceeding. Some of the warning messages are somewhat ambiguous. 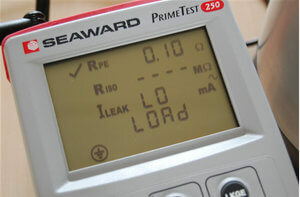 The Seaward Primetest instruments shows ‘Lo Load’; the Kewtech KT71 ‘oFF’; and the Metrel PAT testers ‘L-N Resistance Too High’. But all off these warnings mean the same thing - Check the appliance is switched on! Appliances must be switched on. But it’s not always as simple as flicking a switch. Equipment fitted with a thermostat may need to be adjusted to ensure it switches on. Appliances with multiple settings, such as a cooker hob, will require each element to be turned on separately to ensure you are testing at full load. 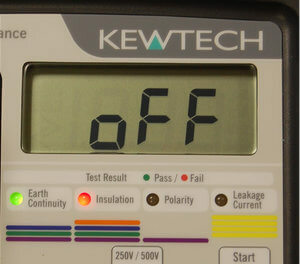 Appliances such as toasters and drills, will require the switch to be continually pressed for the duration of the test. Many digital appliances can not be turned on before they are powered up, in which case a leakage test should ideally be carried out in addition to the insulation test. Some items, such as phone chargers, draw very little current when not charging and will often show an insulation test warning even though they do not have an on/off switch. The insulation test warning may also be an indication that the fuse has blown. The functional test will determine if this is the case.